The skies over Libya were clogged with U.S. Predator drones during last year’s war. But just because the war officially ended in October didn’t mean the drones went home. A Defense Department official tells Danger Room that the U.S. has kept drone flights flying over Libya, despite the conflict that initially brought them to Libyan airspace ending nearly a year ago. “Yes, we have been flying CAPs since the war ended,” says Army Lt. Col. Steve Warren, a Pentagon spokesman. (CAPs is a military acronym for “combat air patrols,” a term of art that typically refers to several planes flying at once for a particular mission.) The drone flights, done for surveillance purposes, occur with the consent of the new Libyan government. The Defense Department did not release further details about the drone flights. But CNN is reporting that drone flights will assist in spotting the perpetrators of Tuesday’s lethal attack on U.S. diplomatic personnel in Benghazi. 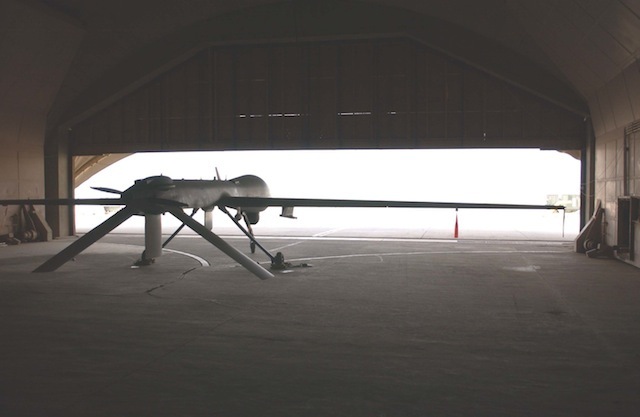 Last year’s war brought drones to Libya in force, both for surveillance missions and to attack Gadhafi loyalists. Between April 21 and October 21, 2011, Predators launched 145 strikes on ex-regime targets. That was twice the barrage drones unleashed in all of 2011 on tribal Pakistan, the place commonly thought of as the epicenter of U.S. drone strikes. In fact, the Libya war’s first U.S. casualty was a drone helicopter. And apparently, NATO’s announcement on October 21, 2011 that the war was over had a caveat for flying robots. The drones won’t be the only tool in Libya to “bring to justice the killers who attacked our people,” to use President Barack Obama’s phrase about the assault on the American consulate in Benghazi. A team of about 50 Marines is en route to Libya, for an as-yet unclear mission that could range from securing U.S. personnel in the country to evacuating them. Defense Department officials have been vague all day about U.S. military assets envisioned to avenge the deaths of four Americans. It is unknown what exactly motivated a crowd in Benghazi to attack U.S. diplomatic personnel. The attack, which took place in at least two waves and involved small arms fire and rocket attacks, was initially thought to be motivated by a movie mocking the Prophet Muhammad made by a mysterious American filmmaker. But later reports suggest that militant organizations might have planned an assault, instead of a spontaneous protest turning violent. Reuters reported that Libyan officials blamed a militant organization called Ansar al-Sharia. Noman Benotman, a Libyan former Islamic extremist, claims that the attack was a reprisal for the U.S. killing a Libyan al-Qaida leader, Abu Yahya al-Libi, in Pakistan. The White House has taken an initially agnostic position. “There is a lot of press speculation for who did this and why but at this stage it would be premature to ascribe any motive to this reprehensible act,” Tommy Vietor, the spokesman for the National Security Council, tells Danger Room. “As the President said, make no mistake, we will work with the Libyan government to bring to justice the killers who attacked our people.” And one of the tools for that purpose will be robotic.